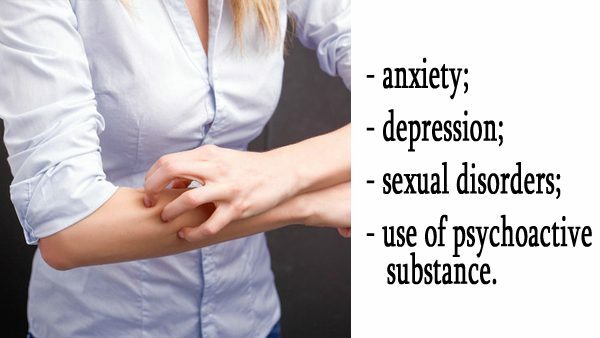 Nervous stress is one of the trigger mechanisms that provoke an escalation and even a primary development of psoriasis. Studies in 117 patients showed that in 40% of them the disease manifested itself as a result of psychological trauma or prolonged emotional stress. And the neurotic symptoms, accompanied by a sense of fear and anxiety, were expressed in women more than men. Studies conducted by Scandinavian scientists in 2004 revealed that for the 35% of polled, psoriasis outbreaks occurred during stressful situations and unrest. Why does stress affect the development of psoriasis? According to the neuropsychological concept of psoriasis development, a stressful situation triggers a series of biochemical and immunological reactions that involve the sympathetic nervous system in the pathological process. This increases the production of adrenal hormones with simultaneous dysregulation of GGA (hypothalamic-pituitary-adrenal axis), leading to an increase in the number of cytokines (small protein molecules). Their influence leads to a rapid multiplication of T cells, as a result of which psoriatic plaques begin to increase in size. In addition, stress at the biological level increases the sensation of itching, leading to accelerated formation of epidermal cells, inflammation of the skin and worsening of psoriasis. The level of anxiety increases if patients experience insufficient support from others. In this case, many patients, embarrassed by visible skin rashes, often stop communicating with people in everyday life, move away from friends and acquaintances. It turns out that stress and psoriasis are closely related: aesthetic manifestations of the disease cause anxiety in a person, which, in turn, aggravates the skin process and increases the production of cytokines. Influencing the brain, they increase stress. In this regard, during treatment of psoriasis, it is important for a patient to exclude stressful situations from his life. A positive trend is observed if the use of antidepressants is combined with psychotherapeutic sessions, relaxation exercises, meditation, autogenous training. Experimental and clinical data obtained by American scientists in 2007 showed that 35% of patients with psoriasis also suffer from depression.